With a focus on solid construction and fresh, simple design with a vintage edge, our signs make a statement in any room of the house. Fits any farmhouse, fixer-upper or rustic decor. Each sign is hand painted and distressed with imperfections that come with using real wood. We like to call this character. All of our signs are distressed and we use REAL pine. If you are looking for something that is perfectly smooth without knots or character- we might not be the shop for you. Our signs have knots. We are a small business and this is a handmade sign- there will be imperfections. We work really hard picking the best boards and spend a LOT of time sanding and prepping to make a product we love and hope you do as well. 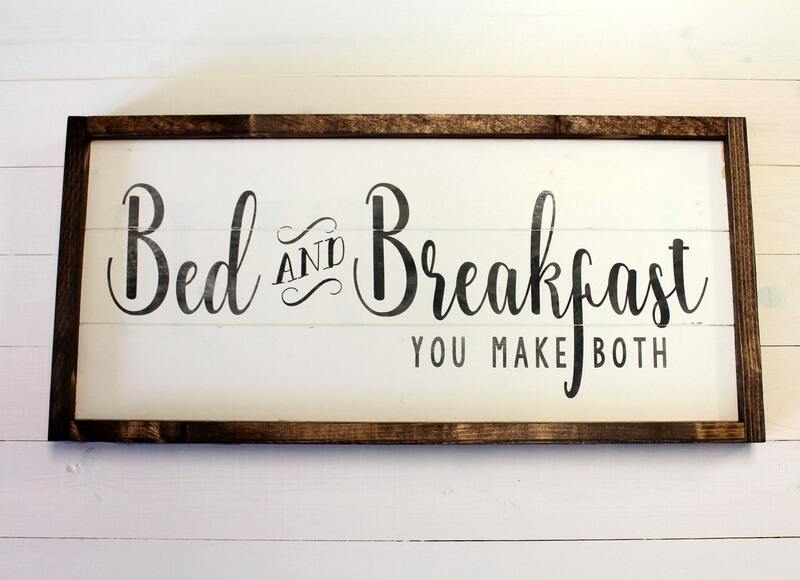 Sooo cute and perfect for our guest room! I LOVED my sign. It goes perfectly with our guest bedroom colors! Due to the nature of our work, production begins as soon as payment is received and processed. All payments are due upon receipt of order. If a payment is not received or payment method is declined, the custom order will not be fulfilled. Please let us know if you are anything but delighted with your order. If there is a complaint, we would appreciate the opportunity to make it right. If the item matches the description by A Simple Impression and the buyer is unsatisfied, A Simple Impression is not responsible for refund. We know mistakes happen and do our best to catch errors in spelling that may occur during ordering. However, if errors are made in the placement of any order, A Simple Impression is not responsible. We do NOT give refunds if you do not like the distressing or knots in the wood. We use real wood- please consider this carefully before purchasing from us. An item may be cancelled up until payment has been processed. Once payment has been processed, we will begin fulfillment of your order and are unable to offer cancellation. We hate paying for shipping as much as you do! All rates are estimated based on location. Because our signs are rather heavy being solid wood, they are not cheap to ship. If there is a big difference in the shipping charged and the actual shipping, we will always refund the difference. Products will be shipped USPS Priority Mail with 2-3 day delivery. Upon shipping, you will receive a confirmation and tracking information by email. If an item is lost during shipping, the total cost of item, including shipping, will be refunded to the buyer by A Simple Impression. If an item is damaged during shipping, we need a picture of damaged sign and damaged box to proceed with possible refund or replacement. We do our best to have orders in the mail as quick as we can. We are happy to accept orders and ship internationally. Please inquire about international shipping rates. During the peak holiday season (October- December) and during market season (March) we typically do not accept custom orders. Please check with us if we are accepting custom orders. We hate paying shipping costs as much as anyone! Our signs are well made and heavy. Our shipping rates are calculated based on your destination. We set the rate super close to the actual shipping cost. Once you add in bubble wrap, shipping supplies and time we are making little to no making money off of shipping fees. We use REAL wood! Wood with knots, character and markings. We also distress all of our signs. If you are looking for a perfectly smooth piece without distressing or character- we are not the shop for you. What if my sign arrives damaged? We spent a lot of time and money on bubble wrap and shipping. We work WAY too hard to send anything we are not completely proud of. If damaged in transit, please send us a picture of the packaging and also the damaged part. We will go from there to make it right. Yes, we offer gift wrapping which can be selected when purchasing. Make sure to let us know what to write and we are always happy to include a gift card. Can I pay a rush fee to get my order quicker? We do offer rush processing (separate listing to purchase in addition to your listing) which will speed up the processing time to ship in 1-2 business days. Add the upgraded rush fee listing to cart with your sign choice. Shipping time will remain the same 2-3 days priority shipping. Please check with us before purchasing rush processing to make sure we are able to make it happen. I live in the area, can I pick up my order and avoid paying for shipping? YES! Add the code LOCAL when checking out and shipping costs will be taken off. We will text or email once it is ready for pick up.